What would you do if a TAP is stuck in your eye? Once in a while I write post about offtrack topics or say gossip. Here is the continuation of the legacy. I was totally dismayed when I read that the water TAP was stuck in man's eye. Imagining the incident myself was just more than horrible. A Chinese man ended up with a water tap stuck in his eye after he slipped and fell in his bathroom. Mr Zhao, 57, of Chongqing, was having his early morning wash when he fell and landed on the tap. His family immediately called firefighters and ambulances who arrived to find him with the tap still jammed in his left eye. "It was so scary, there was blood spouting everywhere," one family member told the Chongqing Business Daily. 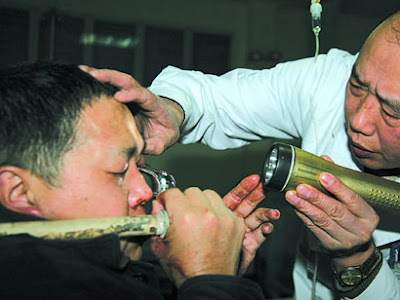 Firefighters cut the pipe with hydraulic shears leaving the tap handle and a section of pipe still stuck in Zhao's eye. Holding the pipe in his hands, Zhao walked to the ambulance and was rushed to hospital where staff called a plumber to try and make the pipe small enough to fit him in a CAT scan machine. "But the plumber couldn't remove it without causing too much pain, so we had to change the plan and first take an X-ray," said Dr Zhao of Daping Hospital. The X-ray showed the tap had gone two to three centimetres into Zhao's eye. Doctors were discussing how best to treat him when Zhao, who had now been waiting for three hours, pulled it out himself. "I felt I could stand the pain, and it wouldn't be a problem," said Zhao, adding that he first looked at the X-ray with his good eye, and saw the tap had not gone in too deep. 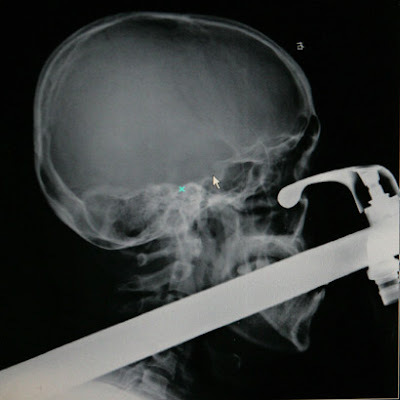 Doctors were shocked by Zhao's bravery and immediately took the CAT scan, which showed he had a fractured nose and facial bones, but amazingly no damage to his eye or brain. Thank god the man's eye was not damaged.